Because many other conditions can cause similar symptoms – including a toothache, sinus problems, arthritis, or gum disease – Dr. Darmon will conduct a careful patient history and clinical examination to determine the cause of your symptoms. Dr. Darmon will examine your temporomandibular joints for pain or tenderness; listen for clicking, popping or grating sounds during jaw movement; look for limited motion or locking of the jaw while opening or closing the mouth; and examine bite and facial muscle function. Dr. Darmon may order a special panographic x-ray. These full face X-rays will allow Dr. Darmon to view the entire jaws, TMJ, and teeth to make sure other problems aren't causing the symptoms. Sometimes other imaging tests, such as magnetic resonance imaging (MRI) or a computer tomography (CT), are needed. 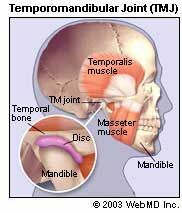 The MRI views the soft tissue such as the TMJ disc to see if it is in the proper position as the jaw moves. A CT scan helps view the bony detail of the joint. Dr. Darmon may decide to send you to a TMD specialist for further care and treatment. Apply moist heat or cold packs. Apply an ice pack to the side of your face and temple area for about 10 minutes. Do a few simple stretching exercises for your jaw After exercising, apply a warm towel or washcloth to the side of your face for about 5 minutes. Perform this routine a few times each day. Take medications. To relieve muscle pain and swelling, try nonsteroidal anti-inflammatory drugs (NSAIDs), such as aspirin or ibuprofen (Advil, Motrin, Aleve), which can be bought over-the-counter. Dr. Darmon can prescribe higher doses of these or other NSAIDs or other drugs for pain such as narcotic pain relievers. Muscle relaxants, especially for people who grind or clench their teeth, can help relax tight jaw muscles. Anti-anxiety medications can help relieve stress that is sometimes thought to aggravate TMD. Antidepressants, when used in low doses, can also help reduce or control pain. Muscle relaxants, anti-anxiety drugs and antidepressants are available by prescription only. Wear a splint or night guard. Splints and night guards are plastic mouthpieces that fit over the upper and lower teeth. They prevent the upper and lower teeth from coming together, lessening the effects of clenching or grinding the teeth. They also correct the bite by positioning the teeth in their most correct and least traumatic position. The main difference between splints and night guards is that night guards are only worn at night and splints are worn full time (24 hours a day for 7 days). Dr. Darmon will discuss with you what type of mouth guard appliance you may need.